Having stopped at another diabolical concrete jungle of a Spanish resort called Laredo, predictably labelled as “charming” by the crap Eye Witness Guide, on the way from Ribedeo, we settled over some indifferent raciones (tapas only bigger) to look at the guides for details about our intended destination, St Sebastian, on the northern Spanish coast. So appalled were we by the pictures and the guide details, we changed our plans, and instead decided to visit the Basque Country. Let me go back to that meal. Yesterday I had been saying that one of the redeeming features of this coastline was how inexpensive and decent had been the food. Yesterday we found the exception. “Special white artichokes” turned out to be of the specially tinned variety. The gambas were overdone and frankly the only thing that was reasonable were the anchovies. It as also twice the price of recent meals. However, it was mid afternoon and we were hungry. 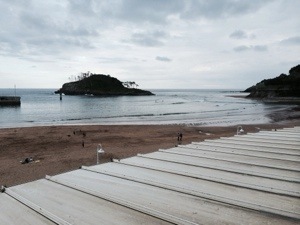 Many people whom I had previously trusted had said good things about St Sebastian, but I have had enough of soulless concrete everywhere, so we consulted the terrible guide and took a chance on a place called Lekeitio on the Basque coast, and eureka! it is beautiful. Finally we have found the charming fishing port that we had been promised so many times in the past week. The first peek at the town was paradoxically depressing. After a 10 mile drive through steeply wooded hills, and with the odd house being a much more hospitable alpine style, our hopes that this town had managed to avoid the planning and construction pitfalls that had befallen almost every other town into which we had ventured on the Galician and Cantabrian coasts, the first concrete horrors were visible through a cleft in the hills. However, things improved dramatically as we got into this lovely old town. We found a hotel in the centre, with private parking and with a sea and harbour view that was beautiful, huge and cheap. We have decided to make it out base for tonight as well, having been constantly disappointed over the past week. One other good thing about this hotel, the Aisia Lekeitio, which to be honest, is in keeping with all other Spanish hotels, is that they don’t allow dogs through their doors. Hence that renegade from the law, Banjo, who has so far escaped justice for his blatant criminal trespass on a beach clearly marked as prohibited to dogs a few days ago, has slept in the car. That means he has not been slobbering, scratching and snoring in my bedroom. That has been the exclusive domain of That Nice Lady Decorator (can you tell she is not reading this daily column dedicated to the furtherance of the influence of Currencies Direct at the moment?). We headed out into the pretty harbour side and square for a restorative beer, and found a fabulous little bar run by a young Basque couple who spoke enough English to give us some proper guidance as to what to see today. They were of a similar opinion about San Sebastián and have given our tour guide, That Nice Lady Tour Guide loads of useful tips about where to go, A tour of the area is in store today, perhaps with a token visit to St Sebastian just to make sure. I do hope that a Basque museum is on the itinerary, I have always been a fan of that style of clothing, although not necessarily for myself you understand. And the villages dreary they’ve found. It’s a bit of a Basquard all round !! Glad you’re having fun !!! !